Nowadays there’s an extensive array of sunglasses to choose from. While some just help protect your eyes from the sun’s harmful rays, some others may even enhance your style apart from offering your eyes sun protection. But some pairs aren’t just for everyone to pull off. You need a style and swagger to sport them, and not end up looking like someone who’s making fun of himself/herself. If you have that swagger in you, the 90’s iconic retro style in the form of clout goggles is for you to claim. If you want a ‘real’ pair, i.e. from a brand that was producing them before the current craze, you can check out this pair from Acne that’s selling for several hundred dollars. Re-popularized by the rapper Lil Yachty, these shades pack some serious stylistic punch- and you can find more affordable options that look basically identical to the more ‘authentic’ options. Just remember to team the pair up with clothes that complement it before you step out sporting these sunglasses, and you will be sure to turn heads your way. Grunge or Rap? : Marked by their distinctly un-grunge silhouette, clout goggles were an instant hit when these classic, iconic sunglasses re-entered the market in 2017. Once made famous by the Nirvana frontman Cobain, these glasses were scooped up right away by Nirvana diehards. Sported by some of the famous rappers as well as those steadily emerging as strong candidates on the popularity charts – from Denzel Curry to Lil Pump, Playboi Carti, and Lil Yachty, clout goggles soon became a staple of influential mumble rappers’ wardrobes. What’s your style? : Whether you are a Nirvana or Cobain fan, buying a pair of clout goggles could make you feel close to your iconic rock band or its frontman. You may even invest in these Cobain-style shades if you love modern mumble rappers, some of whom have played an important role in the popularity of these glasses. If you love your maverick style and need shades to complement it, again these glasses would fit the bill perfectly. Just take a cue from the 90’s (specifically Cobain) or mumble rappers today, who dress in whatever way they want to, and yet have the confidence to pull off these white, oval, large sunglasses by making them seem like a style statement. Can you rock them? : Even if you don’t care about these shades’ provenance or aren’t a style guru, you can still buy a pair of clout goggles just to test how well you can carry them off, as they have become one of the hottest style trends of late. Just look around and you will find plenty of such folks, who are far from the world of rock and mumble rappers, and yet, sport clout goggles with élan. You too may join their league, and perhaps even unintentionally become like the catalysts, who initiate trends instead of being mere followers. Clout Goggles are the 90’s iconic sunglasses that come with large, oval-shaped, white frames, which surround its dark lenses. These glasses were made famous by rocker Kurt Cobain during the 90’s. They rose to fame in 1993 when Kurt Cobain, during one of his most iconic portrait series, ensured the pair stayed wedged over his eyes during the entire daylong shoot. Yet, it’s somewhat ironic that rapper Denzel Curry named them when the frames were brought back to the market in 2017. It was Christian Roth – the company behind Kurt Cobain’s pair, which brought the frames back into the market in May 2017. They named it the Archive 1993/Series 6558. Yet, before the official reissue of these glasses, riff-offs of the silhouette were up for grabs from brands like Raen, Acne Studios, and Saint Laurent. 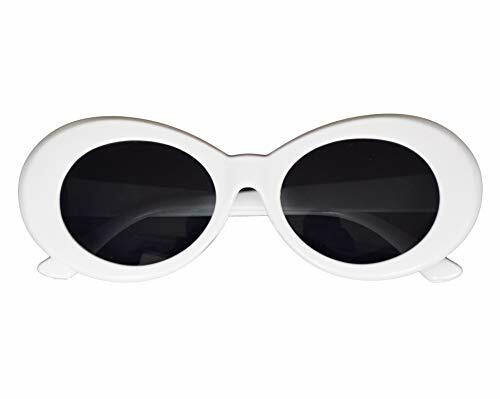 According to the vlogger, clout goggles have been around for a while now, but they just recently spiked up in popularity, initially being worn by Kurt Cobain in the 90s. The clout goggles have gone through a surge of popularity and are now more popular than they’ve ever been. There have been multiple celebrities that have warned the cloud goggles, but the most notable to the popular culture of today is Lil Yachty. He’s not saying Lil Yachty was the first one to wear them, but he was the one to bring the most attention to these shades. He is aware that Kurt Cobain and many other celebrities have worn the clout goggles besides Yachty, but the glasses did not explode in popularity while they were wearing them. Two years ago, little Yachty dropped the Summer Songs EP. He became extremely successful and still is to this day- Lil Yachty could often be seen wearing the clout goggles as they referred to today. They were not referred to as clout goggles, although he was wearing the all-white shades with black lenses, not many people hopped on the trend, but just recently everyone finally began to wear the shades as well- whether Lil Yachty caused this hype wave or not. Since then, many different artists and public figures have been wearing them. More often recently the goggles have become a meme, and many people do not even realize that other artists and celebrities have been wearing them way before they became the meme they are today. The meme has become quite the phenomenon causing many unauthorized replicas of the glasses to be made. 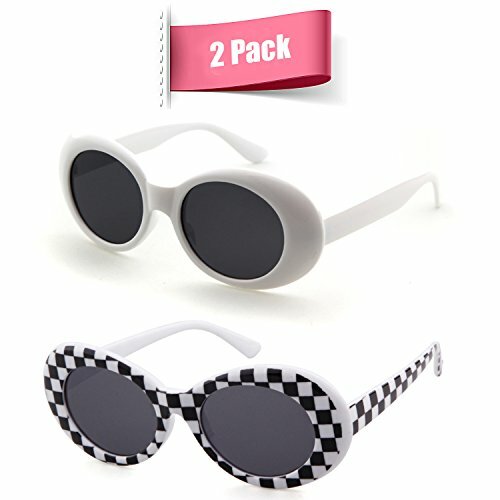 You can now find replicas of the clout goggles at a very cheap price. The original clout goggles that were worn by Lil Yachty were created by the company Acne Studios. They are titled as the Mustang and retailed for several hundred dollars. Obviously many people are not wearing those pairs, Mustang glasses. But the meme still lives on and many people are still rocking their own style. The luxury eyewear company Christian Roth was behind Kurt Cobain’s pair. For some, they are still synonymous with real clout goggles. But nowadays, these glasses are no longer limited to powerful and popular figures in the musical, political, or business domain. Rather, they have shed their ‘elitist clout’ to become attainable by the common man. 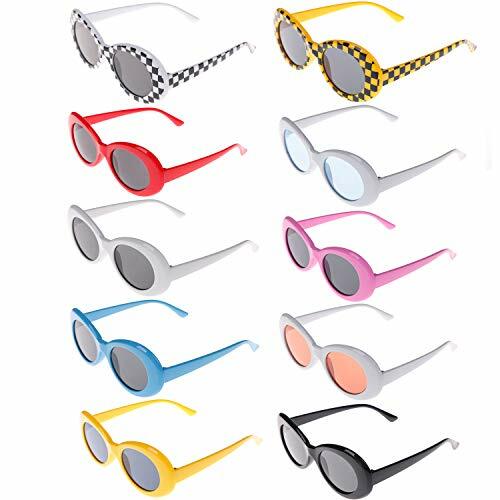 And with their changed status within the streetwear realm, clout goggles have been made available in different varieties by different companies. While some of these varieties retain the original oversized oval lenses enclosed within thick white-colored plastic frames, some others bring variety by offering colored lenses and frames in various styles and colors – from black, yellow, blue and leopard-print to black-and-white checkered and more. Depending on where you are buying your shades from and the style you have chosen (the original sported by Cobain or a modern spin on it with different colored lenses and/or frame), the price may vary. If you want to get an idea of how much you need to shell out for a pair of clout goggles, having about double the amount that you pay for a standard ‘footlong sub’ should be enough. 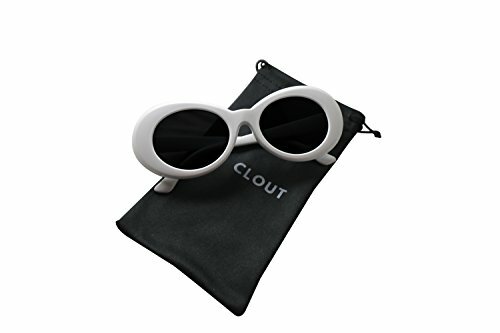 On a different note, you can get your pair of clout goggles for the same price as that of a fidget spinner. If you are vigilant and make your purchase during special occasions when the prices are slashed a bit, you may get your hands on these shades for even less. Online stores and marketplaces seem to be the most favorite places for shoppers to buy their clout goggles from. Since multiple brands and retailers list their products on such platforms, it becomes easy for shoppers to compare prices, read user reviews, and then short-list a few pairs before finalizing one that seems to meet their style quotient as well as budget. 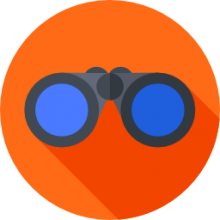 Since sellers are often competing against each other by offering slashed prices and great deals (like free shopping, or some value-added services), buying clout goggles online would mean the chance to possess your pair for a price less than what you would otherwise pay for it. No wonder why a majority of shoppers are taking their search online and even making a purchase once they have found their ideal pair of the iconic shades. When Floridian rapper Curry called the glasses ‘clout goggles,’ he didn’t tell how wearing the pair would improve the wearer’s clout. Amidst the debate of how sporting a pair of these oblong shades could indicate the wearer’s influence on his/her surroundings as well as the online community, and the modern rappers’ attraction for these glasses, clout goggles have quickly emerged as a favorite meme fodder. From Twitter and Instagram to Tumblr, Facebook, and more, you are sure to come across clout memes featuring the classic goggles of the 90’s. However, instead of harming the popularity or sales of clout goggles, the memes seem to have done just the opposite. This is perhaps due to the fact that their meme-worthy status have made these glasses respectable wardrobe pieces, sporting which make the wearers feel they are wearing their cynicism and aloofness on their sleeves, or more appropriately, atop their nose bridges. In today’s contemporary age where sincerity and vulnerability are often considered lame, wearing a product having a meme status could be seen like defying what you ‘should’ wear and embracing something that’s the staple of internet humor instead. And this could be the reason why despite its notorious meme status, clout goggles still boast of an impenetrable popularity. No wonder what were once vintage Cobain sunglasses have now become the millennial consumers’ favorite shades.